1Click Uninstaller is freeware designed to allow uninstalling programs quickly and easily. The program facilitates the uninstall process and eliminates the need for a standard time-taking way to remove software. Now you can forget about opening My Computer or Start Menu, then looking for Control Panel and choosing Add/Remove Programs option; instead, you can uninstall software with just one click of a mouse. What is more, 1Click Uninstaller provides a user with a list of recently installed software, making the uninstall process even easier. This feature will be appreciated by those who hate wasting time searching for a recently installed program and desperately trying to remember its exact name. 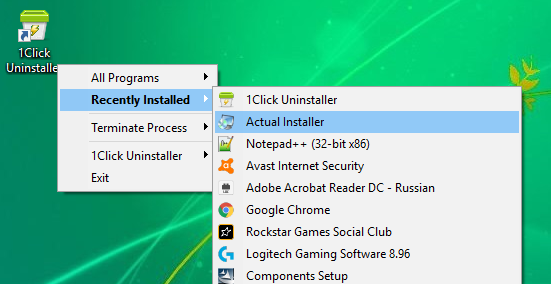 With 1Click Uninstaller you just need to select the program in question from the recently installed software list, click it - and the uninstallation process will begin. A smart solution for those who want to save their time, from IT specialists to home users, it has an intuitive interface, which allows to comfortably work with the program. Also, 1Click Uninstaller allows you to kill / close any hanging processe, even if Windows' Task Manager is unable to terminate it.